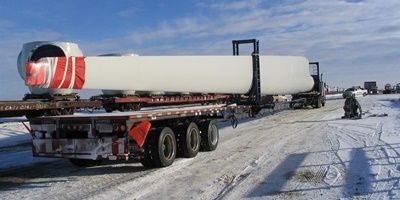 Aspen’s WB-Series (Wind Series) are wind blade hauling trailers which serve the wind energy industry. Aspen’s WB-Series of trailers have a payload of 35 tons, with axle configurations of 7 or 8 axles (including truck axles). 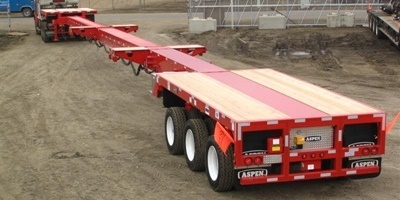 Aspen WB-Series transporters feature master/slave full time active steering and telescope from 53’ to 160’ in length. WB-Series trailers have common air/regulated air suspensions. Experienced Design … Aspen’s WB-Series is meticulously designed by Aspen engineers with over 240 years of combined trailer engineering knowledge. Not only is engineering knowledge important, but the combination of specific trailer industry experience and mechanical engineering knowledge makes our product one of the best trailer brands in the industry. Aspen’s WB-Series was designed from the load down to maximize payload capacity and minimize tare weight. The WB-Series takes advantage of Aspen’s “flex frame” design which allows the frame to flex in all of the right places to allow frame deflection without breaking in key areas of the trailer. Aspen’s low tare weight and highly maneuverable blade trailers feature full time active automatic and manual steering systems for the most efficient and reliable trailers on the road today. Aspen’s roller telescoping design ensures positive alignment of the trailer and makes for one of the most durable designs on the road. 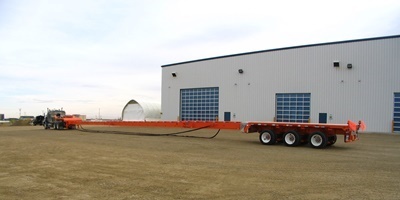 As wind blades grow in length, so does the need to increase the length of your trailer. Aspen’s design allows you to add additional deck sections to your trailer always ensuring your blade trailer stays relevant in today’s constantly changing marketplace.